Adventure on the western faces. More fires – less snow gums? biomass power plant planned for New South Wales far south coast. PLEASE NOTE: this area was badly burnt in the Jan 2013 fires. Check with the local DSE to make sure the track is open before heading out to Sugarloaf and The Gunns. Leading up from the plains of north eastern Victoria, there are many hundreds of ridges that snake up to the Great Divide. It is the higher, alpine ranges that get most of the attention from walkers. Yet there are some great walking opportunities in the mid level ranges, although you will often have to share the trail with 4WDs and trail bikes. 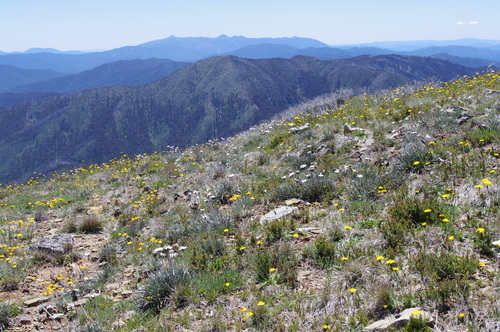 One obvious trip in the Mount Hotham area is Mt Sugarloaf and the highpoint of The Gunns. This is the highest section of a range that starts just near Bright and climbs through Mt Ebenezer and gradually towards the Divide, reaching its highest point at Mt St Bernard. This walk takes you from the Great Alpine road, over Mt Sugarloaf, then along a ridgeline that slowly climbs towards the rounded dome called The Gunns, where there are spectacular views in all directions. START at the old ticket/ entry booth to the Hotham resort on the Great Alpine Road, 1.5 km on the Harrietville side of the intersection with the Dargo road. Park near the booth and walk up on the obvious track past the log cabin and onto Sugarloaf Track. Like a lot of the trail, there are sections here that are quite steep and, at times, loose and rocky. On the second highpoint you reach the top of Sugarloaf (1,511 m, limited views) before dropping steeply to a saddle and highpoint, then a longish climb up a gentle ridge through recovering snow gum forests. As you reach the higher range to the west, turn left at the road junction (marked as leading to the helipad, rather than right on Gunns Track). There is a gorgeous section of remnant snow gum woodland here that survived the fires, and a short steep climb leads you to the cleared hilltop known as The Gunns, which acts as a helipad. From here there are incredible views in all directions: Buffalo seems quite jagged from this side, there is the distant high ridges stretching from the Howitt Plains to Mt Cobbler, closer is the northern face of The Twins, and the higher bulky peaks around Feathertop and Hotham. Return by the same route. Total distance is 12 km, allow about 4 hours for the round trip. Take water. Although not above tree line, this walk is along a 4WD track and mostly exposed to the sun. On weekends you are likely to get some 4WD and trail bike traffic. MAP. Bogong Alpine Area, 1:50,000 SV Map series. Backcountry film festival - Melbourne screening, April 30. 10 great films and pre winter stoke. Bar from 6.30pm. This image: Adam Clark @acpictures from the film Ski the Wild West. Search 'backcountry film festival melbourne' for full details. The paradise that is the central plateau of TAS. Walls of Jerusalem on top left, Mt Rogoona far right and Chalice Lake, on the descent from Cathedral Mountain. End of a great trip. Lake Myrtle and Mt Rogoona, central plateau TAS. Happy #nationaleucalyptday everyone. Lovely snow gum grove, just on the treeline, Mt Howitt. What are the environmental costs of the Mt Wellington cable car? VIC fires burn more than 100,000 ha. VIC State of the Environment report – what does it say about the future of the Alps? Heading towards Pelion West, Central TAS. Geryon (back left) and Acropolis, plus the sharp point of The Parthanon mid left, from the Minotaur.